1. You're a Wizard, Harry! Based on sales of JK Rowling’s Harry Potter books and ticket sales to the subsequent movies, it’s obvious that there are scads of Harry Potter fans from all across the globe. From a Disney Parks fan’s perspective, Universal’s development of the two Wizarding World of Harry Potter areas might be a strange new world, but they’re a wonderfully enjoyable experience and the sheer depth of the theming can be breathtaking. In terms of immersive theme park environments, it’s difficult to top what Universal achieved with both Hogsmeade and Diagon Alley. I’ve been to the Harry Potter Studio tour that Warner Brothers runs in their Leavesden, UK sound stages, and even the actual film sets have trouble keeping up with what Universal offers up in their theme parks for visual impact. Portions of both Hogsmeade and Diagon Alley in Orlando look like they could have been lifted straight from Ms. Rowling’s pages. Add in two truly hair-raising rides in Escape from Gringotts and the Forbidden Journey, a charming commute on the Hogwarts’ Express, heavily movie-themed retail offerings and two perfectly themed and efficiently operated restaurants and you have a real wonder on your hands. Plus, the sight of all those little, fully outfitted, “witches” and “wizards” walking around with their muggle parents never ceases to make me smile. 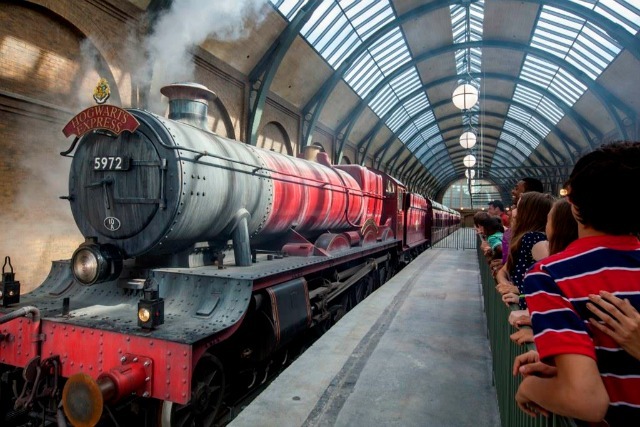 Universal Orlando spreads the Potter lands between their two parks, connecting them with the Hogwart’s Express train ride, making it all but essential to spend two days in their parks to experience the magic in full. Fine. I’ve never begrudged them the time. Both lands are remarkable achievements in theme park design, construction and execution. 2. That “front of line pass thing”? First, let’s dispense with this part. There is no front of the line pass available at Universal Orlando, unless you shell out the big bucks for a VIP guided tour. That, for the record, is also the way you pull off that trick at Disney’s parks. There are, however, two flavors of Express Pass available and they really are a difference maker in your theme park touring experience, especially during the more crowded times of the year. 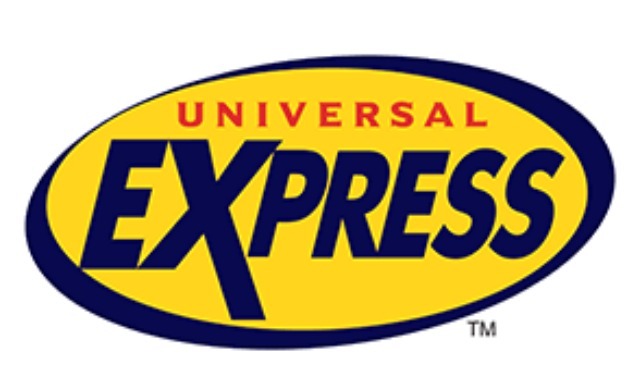 Unlimited Express Passes allow guests to access the express line, skipping the stand by line, at all but a few rides and attractions at both Islands of Adventure and Universal Studios as many times as they choose on a given day. The more budget minded guest can opt for the basic Express Pass, which offers the same experience as the Unlimited version, but only once per ride per day. Express Passes and Unlimited Express Passes can be purchased up to 8 months in advance and for either both parks or for an individual park, with costs running between roughly $50 per day (Express single day at Islands of Adventure) and roughly $85 per day (Unlimited Express for both Islands of Adventure and Universal Studios). They are also available for day-of purchase, if availability allows. Costs can vary for slower and busier times of the year. Related: Like This at Walt Disney World? Try That at Universal Orlando! During the peak season, the ability to skip the stand by line is an absolute thing of beauty that some Universal vets consider an absolute necessity. Another feature of the Express Pass program is that Unlimited Express Passes are available for all guests of the Hard Rock Hotel, Portofino Bay Hotel and the Royal Pacific Resort so long as they have valid theme park admission. The per night prices at these three resorts reflect the true value of that perk, so it’s important do the math for your own group. A couple of important limitations to all this wonderment at worth noting, however, as not every attraction is included in the Express Pass program, but grab a park map and check those out for yourself. The bottom line is this – if you’ve got the kind of party that wants to ride the Incredible Hulk coaster (or some other headline attraction) 5 times in a day and still manage to do anything other than that, then Express Pass makes that a viable option. 3. Yes, Virginia, there really is an off season. Remember the days when you could count on certain times of the year to offer up relatively light crowds at the Central Florida theme parks? Well, sure you do because you can schedule a vacation package right now for one of those off-season times at Universal Orlando. The fall season between the start of the traditional Labor Day and the start of the Halloween season? Yes. The spring season after Spring Break but before Summer Break? Yup. That lovely time in the Central Florida Winter between mid-January and mid-February? You got it. Now, let’s be clear. Such is the popularity of the two Harry Potter themed areas that there will generally always be some planning required to negotiate the physical manifestations of the Potterverse known as Hogsmeade and Diagon Alley. But even those areas become much more manageable when the overall crowd levels in the parks aren’t quite so high. Off season caveats such as shorter operating hours and increased change of attractions being shuttered for maintenance also apply. But for those with schedule flexibility, the presence of real deal slower times of the year in the parks is a real draw. 4. Universal Orlando’s on-site resort hotels are terrific! Much of the chatter surrounding the resort hotels at Universal Orlando centers on the various perks on offer. And yes, having the luxury of Early Admission to the parks or the absolute luxury of Unlimited Express Pass access to most of the rides is indeed worthy of excitement. Often missed in all that talk, however, is just how good these beautifully themed resorts are in their own right. From the “Mad Men go to Miami Beach” kitsch of the value priced Cabana Bay Beach Resort to the Italian Riviera luxury of Portofino Bay Hotel, Universal’s resort hotels have a ton to offer. The two Premiere hotel options, Portofino Bay and the adjacent Hard Rock Hotel both offer huge guest rooms, luxuriously appointed lobbies and common areas, lovely pools and multiple table service and more casual restaurant options. Portofino Bay is modeled after the Italian port town of Portofino complete with an artificial bay bobbing with boats and a retail area littered with Vespa scooters and patio seating. The Hard Rock Hotel is themed in the California mission style as a sort of physical embodiment of the classic Eagles song Hotel California. Except that you CAN check out any time you want. Just go to the front desk. No biggie. Both hotels offer guests both Unlimited Express Pass and Early Admission, with a ticket and attractions desk right in the front lobby. The two Preferred hotels are the Royal Pacific Resort and Sapphire Falls Resort. While coming in at a slightly lower price point, these hotels are still amenity packed. Royal Pacific has, as the name would imply, a South Pacific theme. Sapphire Falls is Universal’s Caribbean-style offering, complete with a Rum Bar and half tiled guest rooms like those you might find in a resort on St Thomas in the US Virgin Islands. Both hotels offer guests Early Admission to the parks, but Royal Pacific also throws in access to Unlimited Express Passes. For right now, Cabana Bay Beach Resort is alone in Universal’s Prime Value category, but it will be joined in July or August 2018 by the Aventura Hotel, currently under construction. Cabana Bay Beach Resort may be my favorite of the Universal resorts. It’s just nails the midcentury modern beach resort vibe, from the vintage automobiles in the front entry area to the Miami-centric color scheme to the V05 and Zest toiletries and vintage Westclox-stlye alarm clocks in the guest rooms. There’s even a bowling alley and a Jack LaLanne Fitness Center. It really has to be seen to be believed. Go. Look at pictures. I’ll wait. 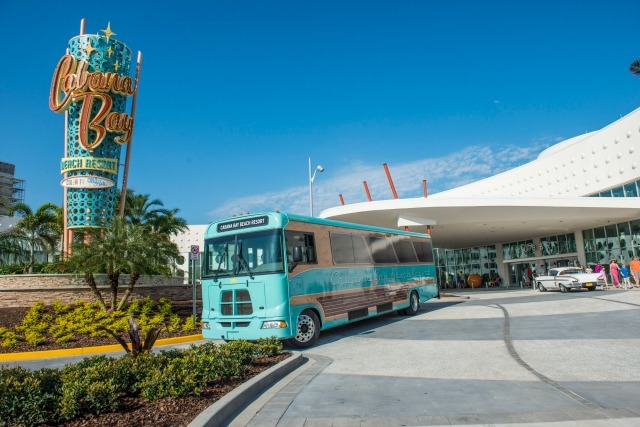 Cabana Bay guests receive Early Park Admission and the power to turn back time … so long as you want to turn back time to 1962. Think about how getting a restaurant reservation works where you live. You want to go out for a special birthday dinner at a favorite local eatery? You ring them up a week or two ahead of time and you’re golden. Or for those more technologically inclined, you open up an app like Open Table and get the reservation you desire that way. Guess what? For the most part, dining at Universal Orlando works like it does at home. Sure, some popular establishments at City Walk like The Cowfish, Toothsome Chocolate Emporium and Bubba Gump Shrimp Company don’t take advanced reservations, but that’s likely true of the region in which you live as well. But a large selection of restaurants at City Market and in the Resort Hotels at Universal are on either the Open Table or Next Table apps or have direct phone-in reservations available. And you typically don’t need to worry about reserving too far in advance in anything other than the most crowded times of the year. And if I STILL mess it up? I’ll just gather my party at Cowfish a little early and sit at the bar that evening. The burgers are still fantastic. 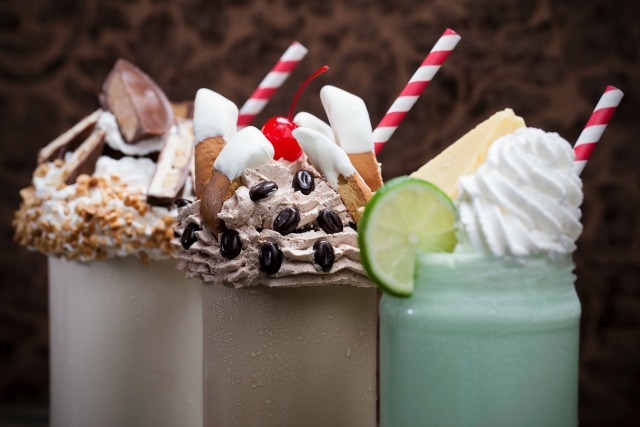 I might even grab one of those ridiculously huge (and delicious) milkshakes from the to-go counter at Toothsome when I’m done. Let’s face it. I’m probably doing both of those things at some point during my trip either way. 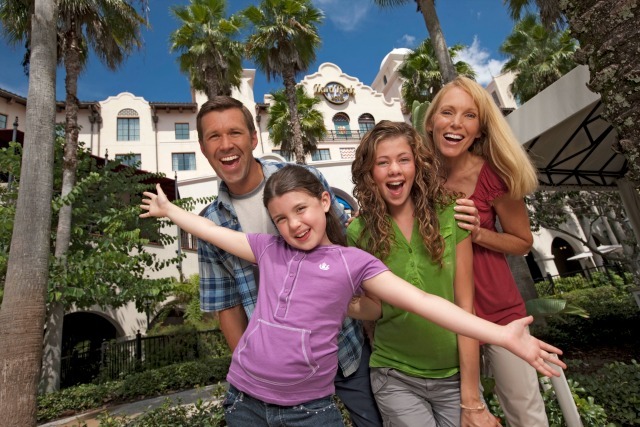 Interested in a Universal Orlando resort vacation quote?